As I told in my previous post, I am working at a customer where we are trying to integrate Microsoft Dynamics CRM 2011 using BizTalk 2010. Since CRM 2011 does not have a BizTalk adapter anymore, we have to use the webservices it exposes, which can be used in BizTalk in 2 ways. I first tried to use the untyped option, where you would have to use mappings with custom XSLT for your communication to the CRM service. I ran into a lot of problems with this, and then decided to use the typed option instead. Using this option, you will create a helper class that does the communication to CRM, which you can then use from your orchestrations. While looking for more resources on this, I ran into this video Peter Kelcey created, which I used as my basis for my solution. The full source for my solution can be found here. The first parameter, url, is the URL where your organization service is living. The second parameter, out, is the class that will be created. The username and password parameters are the credentials of a user in CRM with enough rights to actually use the webservice. Once you have created the helper class you can add this to your BizTalk project. Next we are going to create a new class, that will hold various helper classes used communicate with CRM. I simply call this class HelperMethods.cs. 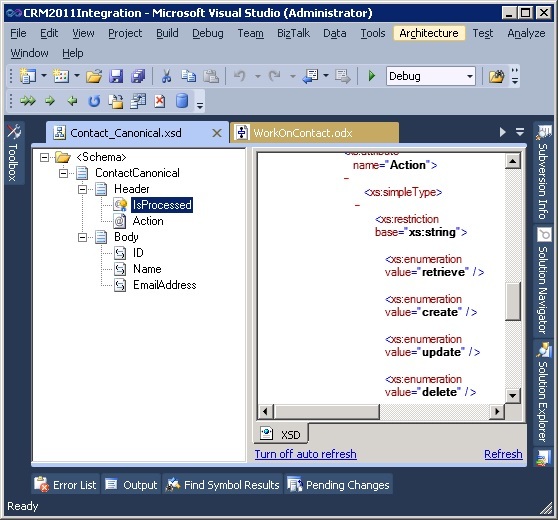 Make sure you add a reference to microsoft.xrm.sdk.dll, which can be found in the CRM 2011 SDK. 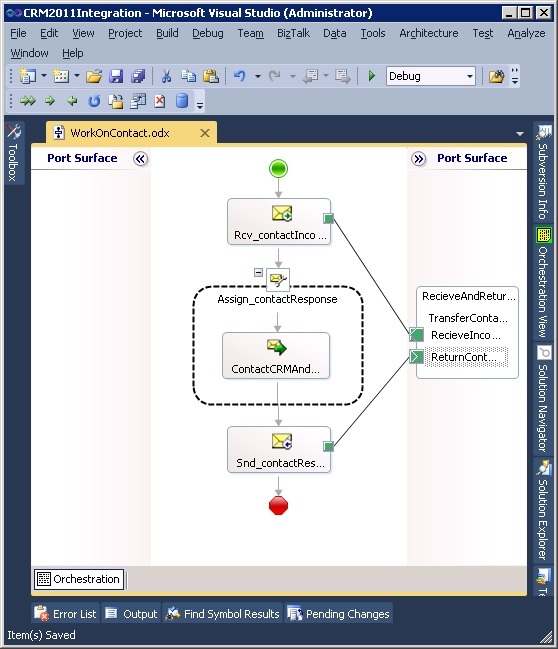 /// Methods used to communicate with Microsoft Dynamics CRM 2011. The first method we are going to set up is where we create a connection to CRM. As always, I have extensively commented my code, so it should be pretty easy to see what everything does. I have a seperate Constants class, where I have stored several strings for username, password, etc. The method finally returns a connection to our CRM system. /// This method opens a connection to CRM 2011 and returns a proxy object that can be used to create, update, read, delete and execute events in CRM. And here is what the constants class looks like. /// Class containing all constant values used in the helper classes. /// The name of the column with the email addresses for contacts. /// The name of the organization used to connect to the CRM webservice. /// The username used to connect to the CRM webservice. /// The password used to connect to the CRM webservice. If you use the same output folder as the where the input xsd file is located, you can attach it to the schema in Visual Studio by using the Show All Files button, and then including it in the project. Do this for all schema’s you will be receiving from your orchestration (probably your canonicals), which will contain the objects you want to transfer to or from CRM. Since we only want to use XMLDocuments in BizTalk itself, we are also going to create a class which is used to create XMLDocuments from our classes representing the schema’s (which we created in the previous chapter). To do this, we will add another method to the class we just created. This method will take a C# object, and serialize it to a XML document. /// Create an XML document from a C# object. The next class we are going to create will contain the actions we want do on CRM, like retrieve, insert, update and delete. /// Class containing the various actions that can be done in CRM, like select, create, update, etc. My first method in this class will be used to look up entities. CRM has to retrieve functions, one uses the ID of an entity, the other can use a custom condition. Since we wanted to be able to find contacts by using the email address, I used the second option. This method creates the query to be used, sends this to CRM, and returns the entities that were returned by CRM. /// Retrieves multiple entities using a query. As you can see a list of ConditionExpression is used, which is used to set up a filter. It contains a column on which we want to filter, the operator to be used (f.e. equals or like), and the value we want to find. /// Create a query that will retrieve multiple entities from CRM. This next method is used to create a new entity, and returns it’s ID. /// Create a new entity in CRM. We also want a method we can use to update an entity. /// Update an existing entity in CRM. The last method in this class will be used to delete an entity in CRM. /// Delete an entity in CRM. For this blogpost I will only show the code I use for working on one entity, contact. All code up to this point can be re-used for all entities, so you only need to to create the class I am going to describe now for each entity you want to work on from BizTalk. Seeing how this is the class you will actually be using in your orchestration, you have to make it serializable, so BizTalk can write it to the database. /// Proxy class used for working on contacts in CRM. This is where you will use the C# classes you created of your schemas. In this class, add an attribute for the type of schema you will be getting from BizTalk. /// Canonical representation of the contact. The schema looks as following. Here IsProcessed is a boolean indicating if the message has allready been processed by a orchestration, and is promoted so it can be used on the filters. Action is an enumerator where a value of retrieve, create, update or delete can be used. Next we are going to create the constructor. This takes in a XLANGMessage, which is the message from the orchestration in BizTalk. To be able to use this type add a reference to Microsoft.XLANGs.BaseTypes.dll which is located in the BizTalk 2010 installation folder. The next method is used to determine the action that should be done in CRM by looking into the message we got. We return the message with it’s new contents to the orchestration. /// Work on the contact. // Check what type of work we want to do on the contact. Here is the code to retrieve a contact. We look up the contact by using it’s email address, then we enrich the message with the data we got from CRM. /// Retrieve a contact from CRM. As you can see, we use a method called GetContactByEmailAddress, which is used to retrieve all contacts with a certain email address. Since we assume the email address is unique, this should return one contact. /// Get a contact by looking it up by email address. We use another method here, GetEmailAddressFilter. This method simply creates a list of ConditionExpressions which will be used to set up the query. /// Create a filter that uses the email address. The next method will be used to create a new contact. We insert the new contact into CRM, and return the message with the new ID set we got from CRM. /// Create a contact in CRM. Now let’s create a method used to update an existing contact. We first retrieve the contact by looking it up in CRM using it’s email address. We then set the new data, and then update the contact in CRM. /// Update a contact in CRM. And finally, the method to delete a contact. This again looks up the contact in CRM by using it’s email address, and then deletes the contact. Since we use the IsProcessed variable in the message to determine if a message has been processed, we create a new canonical contact to return to the orchestration. /// Delete a contact in CRM. That was all the code we need. Now to be able to use all this, we need to create an orchestration. That is all, you can use this framework do do your communication with CRM. As you can see it is some more work then we are used to by using adapters, but it does work quite nicely. I have uploaded the entire solution here. Hopefully it can save you some time when integrating CRM 2011. This entry was posted in BizTalk, CRM 2011 by Eldert Grootenboer. Bookmark the permalink. Thank you for this very clear article, it really helped me on our own integration project. Excellent Article ! wish i knew about this way earlier. Instead of writing many store procedure with similar project.